Pet Wants’ specially crafted pet food formulas are made in small batches with fresh, natural ingredients enhanced with vitamins and minerals for a complete and balanced diet in every bowl. 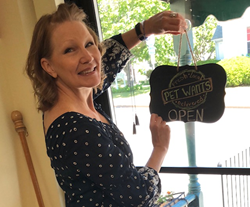 After a career in hospital medicine and oncology, Mary Almgren is excited to be opening a new business focused on helping another family member – pets! Almgren just launched her pet food and supply store, Pet Wants Freeport, at 4 School Street. Pet Wants’ specially crafted pet food formulas are made in small batches with fresh, natural ingredients enhanced with vitamins and minerals for a complete and balanced diet in every bowl. Pet Wants Freeport offers multiple blends of dog and cat food formulas as well as healing salve, calming balm, anti-itch spray, paw wax, homemade treats, freeze-dried food and more. Pet Wants Freeport is open Tuesdays through Saturdays from 10am to 6pm and Sundays from 11am to 4pm. Almgren is looking forward to offering Pet Wants’ signature, free, personal delivery service. “I’m looking forward to being a bigger part of my own community and being a resource for families and pets in this region. Our products are awesome, but Pet Wants is about more than what we sell. It’s also about having an expert here in this community you can turn to with your pet food questions who can help with recommendations for your individual pet. I think that, combined with the freshness of our food, really sets Pet Wants apart,” Almgren said. Almgren’s career has been in medicine, mostly in hospital medicine and oncology. Although going from treating cancer patients to selling pet food and supplies may seem like a stretch, Almgren sees the transition as an easy one. “When I was working in oncology, I spent a lot of time talking to people about nutrition and the importance of a healthy diet. After 18 years of having that conversation with humans about their own diets, I’m looking forward to talking to people about their pet’s diets and how feeding them fresh, high-quality food can make a huge impact on their quality of life,” Almgren said. “My 2-year-old German Shepherd – Jurgen Schnell – switched to Pet Wants food and it has made such a difference, especially with his skin. I’ve lived in Brunswick since 1991 and I’m excited to bring these awesome products to people in my own community. I’m also looking forward to having my sons help with the business along the way,” Almgren said. To learn more about Pet Wants Freeport or to place a delivery order, call (207)869-6006, email MAlmgren(at)PetWants.com or visit http://www.PetWantsFreeport.com.